I’m due with my first child this fall. It’s a boy. We talked about having a family a lot when we were engaged, and we’re both so ready to be parents! Except that my husband’s take on baby names seems to be the crazier, the better. He has what he calls a “boring” name – Michael James, Mike. Our last name is common, too – it sounds like Jen plus son. Because of this, he keeps suggesting names that are the opposite of Michael. So far he’s suggested Justice, Bravery, Bear, Caliber, Remington, Racer, and Maverick. I could maybe live with some of his less obvious crazy picks, like Wade (from Deadpool), Cash (as in Johnny), or Hendrix (Jimi). The only middle name he talks about is Danger. I feel like I’m going to agree to one of his less-crazy name suggestions because I don’t want a baby with a name like a cartoon villain, but I’m not even sure that I like them – I just know that I don’t hate them as much! Help! Please read on for my response, and leave your helpful suggestions in the comments. Congratulations on your first child! In some ways, it’s good news that your husband is taking an active role in naming. But I can see how you’d be frustrated that you’re not finding more common ground! And yet, here’s what stands out to me: while some names on your lists do feel miles apart, I do hear some overlap. Wyatt and Hendrix could be brothers. So could Maverick and Levi. It’s not your style that’s so many miles apart – it’s your take on popularity. 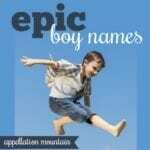 The name you like qualify as cool, modern boy names. They’re just fairly familiar. Meanwhile, the names on his list veer towards the wait-is-that-even-a-name column. It has to be cool and current. Neither of you is interested in classic boy names, like Michael and James, at least as firsts. It has to be familiar as a given name. The line you’re drawing is reasonable. Caliber Danger is a lot of name, and might be every bit as tough to wear as Michael James. It has to have a certain amount of balance. 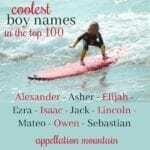 If you used a first name like Levi – still cool, but a name with history galore that currently ranks in the US Top 100 – it might argue for Danger as a middle name. Or Caliber or Bravery or … you get the idea. But if you do end up with something like Maverick, then a more traditional middle can anchor the name. Maverick James sounds much more reasonable than, say, Maverick Racer. I’m going to suggest some names that are cool and current, rank at #250 or higher in the US as of 2017, and hopefully fall somewhere between your husband’s favorites and yours. Archer – It reminds me of Caliber and Remington, a name with a tie to weaponry – but a very subtle one. Archer ranks #254 in the US. Gage – If you know your Stephen King, this was popularized by a character in Pet Sematary. But it’s gone mainstream since, a cool sound with an intriguing meaning – to measure or to pledge. Gage ranks #328. Hayes – Hayes sounds like a preppy, presidential surname. But it also sounds like haze, which makes it far cooler. Hayes ranks #409. Lennox – Lennox shares the ‘x’ of Hendrix, and claims a cool namesake, too: former world heavyweight champion Lennox Lewis. Lennox ranks #408. Nash – In the 1990s, Don Johnson starred as Captain Nash Bridges with the San Francisco Police Department. While the show is mostly forgotten today, it sent his character’s name climbing up the charts, to #283. It feels a little less rock and roll than Cash, but still plenty cool. Pierce – Maybe it’s because Pierce Brosnan played James Bond. Or maybe it’s because Pierce is yet another name related to weaponry. But Pierce also straddles the traditional/edgy divide with style. Pierce ranks #522. Walker – Remember the Will Ferrell movie Talladega Nights, where his kids are named Walker and Texas Ranger? 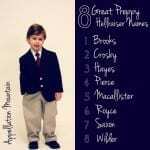 Turns out that Walker actually had a long history as a boys’ given name in the US. It’s the W. in George W. Bush. (And the W. in his dad’s full name, George Herbert Walker Bush, too.) Walker ranks #314. Wilder – I think Wilder hews more closely to your husband’s style. 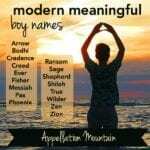 And yet, it also suggests a certain rugged outdoorsy style, as well as a traditional surname choice. Wilder ranks #573. A handful of the names on both of your lists fit this category, too. There’s Cash at #285, Reid at #288, Hendrix at #349, and Wade at #362. My suggestion is that you focus on this middle ground and look for more names that fall somewhere in between your favorites and his. As for the middle name conundrum? It strikes me that if you can agree to stick with the middle ground, there’s always the option of choosing two names you just plain love. Walker Hayes Jen+son sounds great; so does Gage Hendrix, Archer Reid, or Hendrix Wade. Readers, what would you suggest to Kayla and Mike for their son? Any tips on compromise? 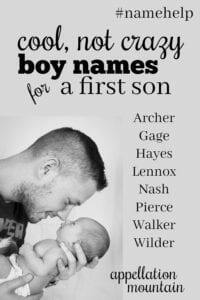 Lennox, Nash, Archer, and Walker all seem like great suggestions. I agree that you can probably find a cowboy name that is a little less wild than the ones he is suggesting. Good luck! How about Talon or Keston or Tyrin? I’ve seen a lot of his names on honor rolls for kids here. They’re not unheard of. Rowdy is a name I’ve seen a few times, as well as Stetson, Sterling, Trek, etc. Do you like Ryatt? Like Wyatt crossed with Ryan but sounds like Riot? We have a Dashiell Maverick. He often goes by Dash or even Dashy Mav. We planned to call him Dax but it never stuck. I live in the Rocky Mountains, so a lot of the names of BOTH of your lists are pretty familiar to me. I am, as readers noted below, a fan of using Justus instead of Justice, and I know a young man with that name. It’s perfect! From your list I like Wyatt best, and feel like it’s closest to your husbands list in style. I wonder if you would like Easton? Or even Eastwood? Zane? Gentry? I just want to add my 2 cents that very few of his names are actually that rare. Maverick, Bear, Wade, Cash, and Remington are all pretty familiar to most of us. I live in the west, so your names seem totally normal and cowboy cool to my ears. Wyatt is probably too popular for your husband, as is Levi, but they still seem to fit the same category of cowboy cool as your husband’s name picks. Levi, of course, can play western or Biblical depending on his sibling names. Everything Abby said is dead on. You have some gorgeous name choices between you and your husband. I love how many one syllable choices you have. Brothers named Bear, Cash, and Rhett is just plain awesome. I love Maverick James. That name is fabulous. Good luck and have fun! My husband always insisted that all of our children should be named Withington Cheesemore. He would be serious about a name discussion for about thirty seconds at a time until we were in the hospital. He drove me nuts. Hopefully your name discussions start being fun instead of angsty. For what it’s worth, I know a Justus, Maverick, Remington (nn Remi) – all boys -and Hendrix (girl). They are all very wearable and awesome on the little humans who have them. We had exactly this problem! My husband is also a Mike with a common last name. And my name is extremely unusual. He wanted the most unique names with the most different spellings he could think of for our boy. I wanted more traditional, or atleast familiar. The names he suggested were things like Phoenyx. The names I suggested were like Theodore and Henry. Ultimately we decided on a name that kind of suited both our styles. We picked an Irish name with its traditional Gaelic spelling. The spelling made the name unique in unusual in the US, which made my husband happy. But the sound of the name was more familiar, if unusual. Our boy now fits right in with the Rylans and the Keegans and the Kiernans running around the park, but at the same time has his own unique name. I’d add Zane as a suggestion as well! Justus is an ancient name that sounds exactly like justice. Abby’s advice is smart! Comb through the Top 500 and see what jumps out at you both. What do you think about Rawls? My husband is also a Michael James Common-last-name. When we were naming our first, his suggestions were things like Dafydd or Angharad, and mine were things like Jonah and Meghan. The compromise we settled on had a few parts: A.) No first names from the US top 1000. B.) It had to be something relatively easy to pronounce in American English. Unfamiliar is OK, choosing between 2 variant pronunciations is OK, but no consonants that make completely different sounds than would be expected. C.) A “normal” middle name that we also actually like was a must. (No fluffy fillers). It offers an easy escape route if they decide they don’t like their “weird” first names. We have mostly used family names for this. D.) It has to have history as a name – no new inventions or cre8v spellings. E.) We both have to like it. 3 of our 5 kids did end up with names with Welsh origins, but a little more mainstream than his original list. One of the others has a name that is very rare – seldom given to more than 5 babies in a year – but it is built of very common elements. 2 of the 5 have “vintage” names that hover just outside the top 1000 now but were in it 100 years ago. Trying to find that sweet spot of “rare but not too crazy” has become a fun challenge. Honestly, looking at your husband’s list – those names have a certain style, but most of them are fairly well established in common usage (Maverick, Justice, Wade, Bear, Cash, Remington). I’m pretty sure they wouldn’t pass our “not in the top 1000” test. I don’t know if that helps or not – if you don’t like something, you don’t like it. But they aren’t quite as far out there as you might think. Colt (ranked #269): this might be too popular for your husband, but it definitely has that strong-willed cowboy feel. Kade (ranked #412): not sure how you feel about “invented” names, but this one feels like it matches the feel of names like Cash and Wyatt. Rex (ranked #609): sounds similar to Rhett but also has that cool X sound. Trent (ranked #655): surname-y like Vaughn and Reid, with a bit of a tough guy edge because of the Nine Inch Nails frontman. Tyson (ranked #324): Not sure what part of the country you’re in — in the South this name might be too strongly associated with the chicken processing company — but it’s also got a strong image and that surnamey style that really seems to be to your taste. Vance (ranked #834): It has that V that you both like, and something about the image feels right.